If you travel constantly with your kids in your car then you might be searching for a convertible seat that can be installed in your car conveniently. Your search can end with the First Years True Fit Recline Convertible Car Seat as you can install and use it easily for your infants up to five pounds of weight to sit in your car safely while traveling somewhere. Rewarded very highly by NHTSA for its easy to use installation features and child safety benefits. This seat comes in 3 colors which are Navy/Grey, Disney Minnie and Pink Butterfly so that you can give a personalized look to your child. It has color-coded belt paths which will help you in installation and make the complete process lot easier. Extra light weight of the seat makes it more convenient to use in the car. You can use it as per the needs of the growing baby though the adjustable features of this particular seat. 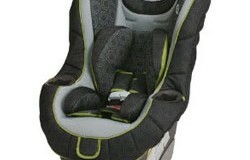 The seat is designed to keep the baby safe while traveling in the car through its five point harness system. 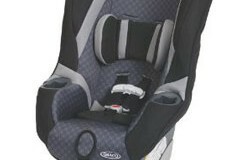 First years convertible car seat is tested for side impacts as per the standards of the industry. Company offers one year limited warranty for any manufacturing and material defect, if used as per the instructions of the manufacturer. The size of the product is 17.5 X 19.5 X 27.5 inches which make it convenient place in the car even not in use. Seat can be adjusted to front facing and rear facing as per the needs of the baby. The seat can be made fit to the size of the child by adjusting and repositioning its straps. 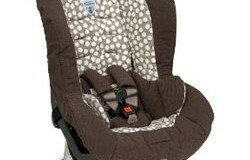 First Years recline car seat can keep the baby safe with the help of its snap pads and straps. You can make it comfortable for your baby by adjusting its head rest.The head rest of the seat can be removed while repositioning it. 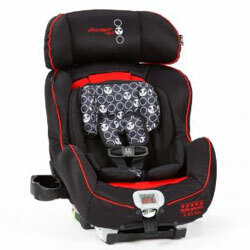 Extended Poly Propylene foam is used as cushion lining in the seat to enclose the child for the additional safety and comfortability of the child. The convertible car seat from First Years is designed with a consideration of safety and comfort of the child and easy usage. The owner of the car can enjoy the effectiveness of the seat by seeing his child safe and comfortable while traveling with him. This seat not only makes the child feel comfortable but also keeps his/her mood happy due to its comfortability and safety features. While travel with you in your car your baby can easily and safely site in the reclined seat. Your baby will enjoy the journey as much as you without giving you any reason to worry about. If you are a constant traveler with your family and children then the First Years new True Fit seat can be favorable choice for your children not only due to its protectiveness and comfortability but also for the ease of installing it. This recliner seat allows you to keep your infants below five pounds of weight safely and comfortably with you while traveling anywhere. If you don’t want to keep a constant eye on your infant at the time of traveling, then this product is just for you. Summary : A high performing product in this price range.